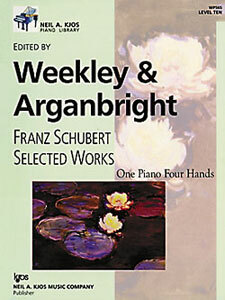 Franz Schubert Selected Works (Piano Duets) Discounts Apply ! chubert's astonishingly varied fou-hand music is a treasury of melodic invention, emotional range, rhythmic excitement, and profound strength. Dazzling and brilliant advanced performance choices include: Fantasy in F minor, Allegro in A minor, Andantino varié, introduction and Variations on an Original Theme, Op. 82, and Marche caractéristique.